Please check out our newest high accyuracy Digital Pressure Gauge, the DPG210, many ranges are in stock, available for immediate delivery, and are priced competitively. The DPG4000 takes the concept of a test gauge to a new level. It combines the accuracy of digital technology with the simplicity of an analog gauge, delivering performance, ease of use, and a feature set unmatched in the pressure measurement world. Setup of the DPG4000 is fast and straightforward, involving a menu driven display with minimal text and intuitive functions. The gauge is simple enough to be used anywhere in the world, without the need for multilingual displays. It also incorporates a built in data logging function which when combined with the DPG4000-SW software allows it to function as a high performance pressure data logger. The unit can store up to 8500 data points which can then be downloaded and stored in a variety of formats including ASCII text, comma delimited text, and Micorsoft Excel Spreadsheet using the software. The software can also be used to configure a wide range of settings including logging interval, number of data points per run, capture mode and type of data. Low-Battery Indicator: Icon displayed near the end of battery life. Remaining battery life can also be displayed on bar graph. 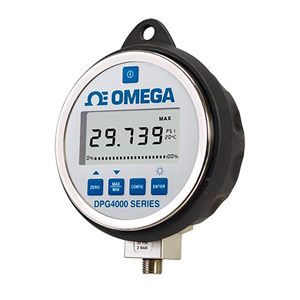 注: Each DPG4000 gauge comes with batteries (when applicable), protective rubber boot (with battery powered models), calibration certificate and operators manual. Lower fitting is standard. To order with rear fitting add suffix "-RM" to part number and $75 to the price.